Give your kids teeth the best start possible! Make an appointment today for your children because we think they are special and precious as well! New research on the BEST way to clean your teeth...has returned a neutral verdict. We don't know the best way to clean our teeth. According to a study published in the British Dental Journal in August 2014, virtually every dental school, tooth paste company, tooth brush company and Dental professional association has its own idea about the best way to brush your teeth. There is not even concensus about how long we should brush for and how often. The best way is to ask us how your tooth brushing is going. We will help you with the tricky difficult places in your mouth and give you great advice tailored just to you. Go to the bathroom and clean your teeth please. Wouldn't it be great if we can make this activity a fun part of his life and your life? How can we do this? Maybe your child needs to control his environment. Have you considered giving him a sense of control in his own world (and hopefully relieve you of some stress) by letting him have fun in selecting his own toothpaste and toothbrush? Can you brush your teeth with your child so he can see how to clean teeth properly and help motivate him to copy you? Can your child see himself in the mirror? Perhaps a stool or step to make reaching the basin easier. Would an electric toothbrush be easier? What stories are we telling ourselves and what message are we sending to our children? Is this what you hear yourself telling your child? I am sick and tired of this fight. Now just get into the bathroom and don't come out until you have cleaned your teeth! If you tell yourself that your child has power over your feelings you will diminish your self control and put the responsibility for your feelings on your child instead of you. Pick a time when you are not tired or upset about other things happening. Stay calm in the face of this adversity and it will be a good role model for your child and give you the energy and patience and creativity that you need to solve the problem. Humour is important to help you stay in a positive emotional state to think and act appropriately. What are you looking for in the long term? Force doesn't allow for a win: win situation. Do you want to set up a battleground or constant screaming match over small everyday issues by saying that strength or determination wins? Suggestion: Give your child choices. 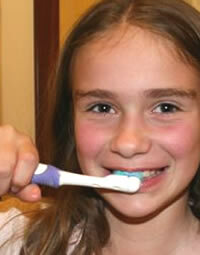 "I understand that you don't want to clean your teeth but it is very important to keep them clean and healthy. Do you want me to help you clean them or do you want to do them yourself?" Labeling can stop us working out the best way for US to act. It can be very damaging for your child to take to heart the label you have given him. A negative self-image is very damaging. HIS behaviour is not who HE is. The child is not stubborn. The behaviour in this instant is stubborn. The child has behaviour, which he has attached to HIS feelings about tooth cleaning. You can help him label the feelings and help him understand that at this time the behaviour is not acceptable. Your child is not stubborn. There will be times that you will rejoice that your child has been able to stubbornly refuse to follow peer pressure because he feels distressed or uncomfortable about something. It is the behaviour in this instant that needs addressing. Suggestion: Acknowledge the problem and invite discussion. Tell me what you don't like about brushing. I would like to help if I can. This validates your childs opinion as a person and gives both of you information to work towards a solution. Keep the goal in mind. Learning is about co-operation and teamwork. A win: win situation may be. When your teeth are clean we can read some stories together. Remember the rule is that in order for your child to do what he wants, he needs to accomplish the required chore first!